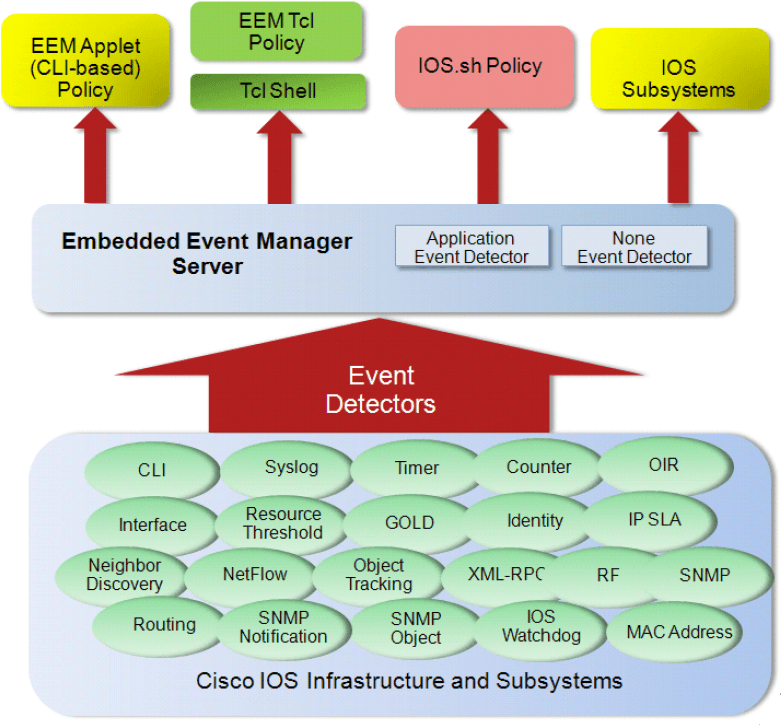 The Cisco Embedded Event Manager or Cisco EEM is a software component of Cisco IOS, IOS-XR, and NX-OS that provides real-time network event detection and onboard automation. EEM allows you to automate tasks, perform minor enhancements and create workarounds and can makes life easier for network operators by tracking and classifying events that take place on a network device and providing actions options for those events. EEM uses event detectors and actions to provide notifications of those events. SNMP – Monitoring SNMP objects, events and notifications (SNMP traps) of the device. Syslog – Responds to various syslog messages, allowing for matching on regular expressions of the content of the message. Counter(s) – Monitoring and responding to interface counters when cross threshold settings. CLI – Screening CLI input for a regular expression match or when a special parser character is entered, like Tab or “?” (question mark). Timers – Countdown, watchdog and CRON. IP SLA and NetFlows events. Routing – When a route entry changes in the Routing Information Base (RIB). RPC – Provides the ability to invoke EEM policies from outside the router over an encrypted connection using SSH. The RPC event detector uses Simple Object Access Protocol (SOAP) data encoding for exchanging XML-based messages. This event detector can be used to run EEM policies and then receive output in a SOAP XML-formatted reply. OIR (online insertion and removal) – When a card is removed od inserted. Resource – When the Embedded Resource Manager (ERM) reports an event. Enhanced Object Tracking Event Detector (EOT) – When the status of a tracked object changes. Another EEM policy – Another EEM policy may publishes an event. None – This event detector is to test the EEM script/applet using “event manager run” command. Switching to a secondary processor in redundant hardware configuration. Sending a short e-mail message. Reloading the Cisco IOS software. EEM Applets – Supported since EEM version 1.0, these policies are specified and defined in the configuration of the device and were designed to allow simple interface into Cisco’s EEM feature. Only one event configuration command is allowed within an applet configuration, or up to six events with correlation since EEM 2.4, and multiple action are allowed. Use the command: show event manager policy registered to display a list of registered applets. TCL Scripts – Supported since EEM version 2.0, these policies are defined in separate files stored locally on the device and specified (registered) by adding a single configuration command. Tcl allows for more complex policies and some EEM features like timer subscribers are (currently) only supported in EEM Tcl. IOS.sh Shell Policies – Supported since EEM version 3.2, these policies are defined in separate files stored locally on the device and specified (registered) by adding a single configuration command. Shell policies utilize the IOS shell feature. Support for shell policies is limited to some switching platforms. In this article, I will only talk about EEM Applets. TCL Scripts and IOS.sh need both another dedicated post. The EEM feature is constantly evolving. EEM 1.0 was first introduced in 12.3(4)T, but did not offer much in the way of power. Now, with EEM 3.x and 4.0 in recent versions of IOS, policies can interact with the CLI, send messages between devices, process complex show command output, intercept SNMP messages, manipulate files, and much more. If your device does not support this command, you do not have EEM 2.4. To find out if your device supports at least EEM 1.0, check for the presence of the show event manager ? command. That is, if you run show event manager, then type a ‘?‘, you should see command syntax. If so, then your device supports EEM 1.0 at the very least. EEM 2.0 was only ported to the 12.2(26)S and only existed in the 12.2S train. As of 12.2(30)S and higher, those platforms support at least version 2.1. To determine if your device supports EEM 2.1, you should check to make sure it supports the show event manager environment command. If this command is supported, then the device supports EEM 2.1 at the very least. These techniques work for all IOS and IOS-XE devices. EEM built-in environment variables are a subset of the Cisco-defined environment variables and the built-in variables are available to EEM applets only. The built-in variables can be read-only or read-write and may apply to one specific event detector or to all event detectors. _event_id – Unique number that indicates the ID for this published event. _event_type – Type of event. _cli_msg – The fully expanded message that triggered the CLI event. _track_number – The number of the tracked object. _track_state – The state of the tracked object; down or up. _interface_name – The name of the interface to be monitored. _interface_parameter – The name of the interface counter to be monitored. _interface_value – A value with which the current interface counter value is compared. _snmp_oid – The SNMP object ID that caused the event to be published. _syslog_msg – The syslog message that caused the event to be published. _email_server – A SMTP mail server used to send e-mail. _email_to – The address to which e-mail is sent. _email_from – The address from which e-mail is sent. _email_cc – The address to which the e-mail is copied. test(config-applet)#event syslog pattern "Interface GigabitEthernet0/0/1, changed state to administratively down"
test(config-applet)#action 1.0 cli command "enable"
test(config-applet)#action 2.0 cli command "config t"
test(config-applet)#action 3.0 cli command "interface gi0/0/1"
test(config-applet)#action 4.0 cli command "no shutdown"
test(config-applet)#action 5.0 cli command "end"
test(config-applet)#action 6.0 cli command "who"
test(config-applet)#action 7.0 mail server "10.10.10.10" to ".noc@my-company.com." from ".EEM@cisco.com." subject ".Interface_gi0/0/1_SHUT." body "Current users $_cli_result"
So here, the triggered event is the syslog message and the action is first we do a “no shut” and then we send an email to the NOC team with the name of the logged-in user at this moment. action 3.0 cli command "interface gi0/0/1"
action 6.0 cli command "who"
action 7.0 mail server "10.10.10.10" to ".noc@my-company.com." from ".EEM@cisco.com." subject ".Interface_gi0/0/1_SHUT." body "Current users $_cli_result"
DEBUG(cli_lib) : : CTL : cli_open called. DEBUG(cli_lib) : : OUT : Enter configuration commands, one per line. End with CNTL/Z. test(config-applet)#action 1.0 syslog msg "$_cli_msg has been disabled." Jan 25 11:36:26.030 MET: %HA_EM-6-LOG: NO-RELOAD: reload has been disabled. The pattern itself – Between “”, we can use normal text and also Reg Exp. sync <yes/no> – Specifies if the policy should be executed synchronously before the CLI commands executes or not. skip <yes/no> – Indicates if the CLI commands should be executed or not. occurs <1-32> – Indicates the number of occurrences before the EEM applet is triggers. One is the default. test(config-applet)#event tag e1 syslog pattern ".*UPDOWN.*Ethernet1/0. *"
test(config-applet)#event tag e2 syslog pattern ".*UPDOWN.*Ethernet1/1. *"
test(config-applet)#event tag e3 syslog pattern ".*UPDOWN.*FastEthernet0/0. *"
test(config-applet)#event timer cron cron-entry "0 0 * * *"
The file prompt quiet command is to disable the confirmation questions from the IOS. Now you can see the real firepower of EEM!